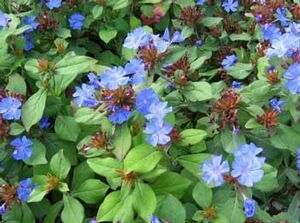 One of the most rewarding, colorful, and easy-to-grow perennials, Plumbago reaches just 12” in height and forms a green ground cover, covered with clusters of gorgeous peacock blue flowers from August into October. The foliage turns deep mahogany in fall, but the brilliant flowers keep opening which makes an eye-catching show. 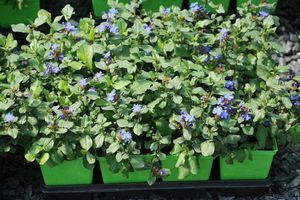 Excellent for edging, under planting shrubs, or as a ground cover over bulbs as it breaks dormancy late in spring. When new growth begins appearing in late spring, remove the dead stems to the ground. 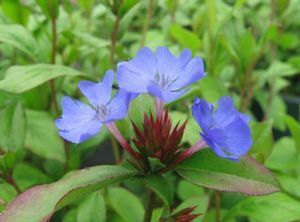 Plumbago is reasonably drought-tolerant, requiring extra watering during long periods of drought. Divide in spring, as needed, to keep it in bounds.